Whenever someone mentions the United Arab Emirates, everyone’s first thought is always of Dubai with its skyscrapers, vibrant nightlife and glamorous shopping but there are 6 other emirates, each of which has something different to offer a family seeking an all year round sunshine destination. If you are looking for somewhere safe, fun and relaxing where the whole family will enjoy their time then you should really be looking east to the hidden gem that is the mountainous emirate of Fujairah with its beautiful coastline on the Gulf of Oman. 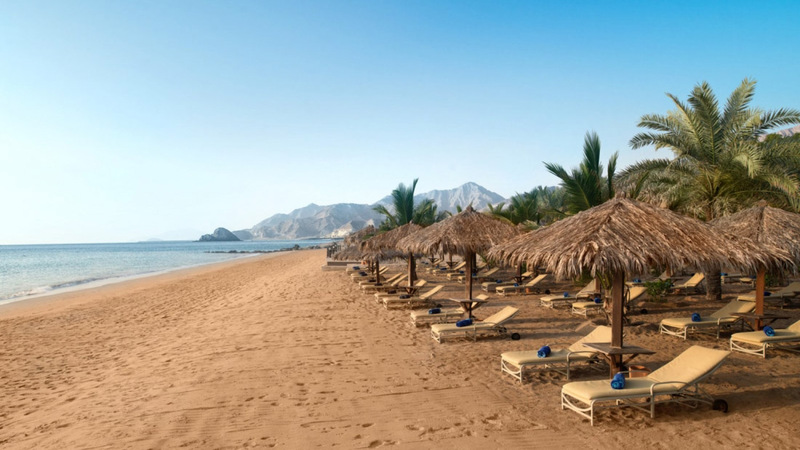 Here, nestled between the glimmering Indian Ocean and the spectacular Hajar Mountains you will find the 5-star Le Meridien Al Aqah Beach Resort. 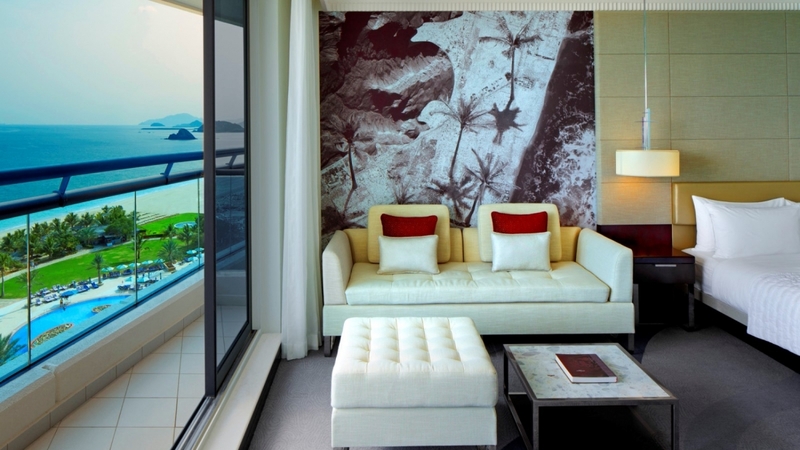 The resort is just a 90-minute drive from Dubai International Airport. The drive itself takes you through some spectacular scenery as you pass through the emirate of Sharjah with its gently shifting orange sand dunes into Fujairah and the impressive jagged mountains of Al Hajar before finally reaching the shores of the sparking Indian ocean. We had lots of fun playing ‘spot the camel’ as we scanned the spectacular horizon throughout the drive. Arriving at the hotel, we were warmly greeted by the staff in the grand lobby and were given a tour of the hotel’s extensive facilities before being shown to our room. 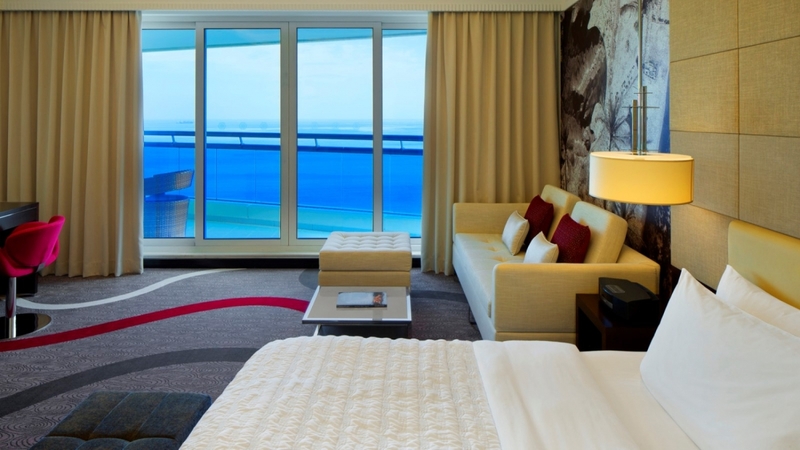 Our room on the 17th floor was bright and spacious and looked out over the ocean. Being so high up afforded us a spectacular view which we could enjoy from the comfy table and chairs on our private balcony. 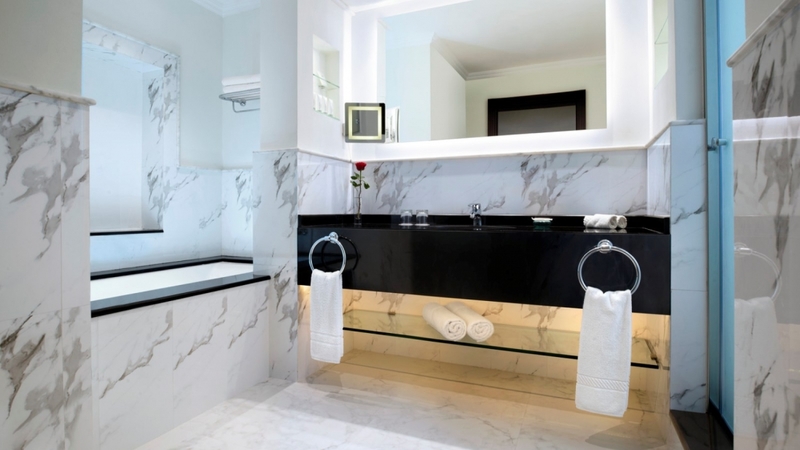 The room came with a huge bathroom, decked out in white marble with a large bath and separate shower. There are plenty of choices of rooms, from twins to inter-connecting rooms if you have older children. From our balcony we could see the whole resort spread out beneath us including the enormous freeform swimming pool so we wasted no time in getting down there for a quick dip. The pool, one of the largest in the UAE, is the epicentre of the hotel complex. Divided into two parts and with a gently undulating border, one end of the pool has a softly sloping shallow area with no steps which is perfect for young children getting in and out of the water and the other end is a full 1.8m giving you ample room to have a proper swim. A number of small islands with gushing water features break up the centre of the pool making it feel all the larger and a well stocked pool bar offers you the chance to sip a nice refreshing cocktail, while watching the kids splash around, without having to leave the comfort of the soothing waters. There are also numerous lifeguards n duty at any one time, which gives you real peace of mind. There are plenty of sun loungers and umbrellas spread around the pool for relaxing in (or out of) the sun and attentive members of staff will make sure that you want for nothing whilst you do so. In the afternoons, a small group of (very talented) musicians appear and the pool is basked in the sounds of relaxing live acoustic music which was a very nice touch. 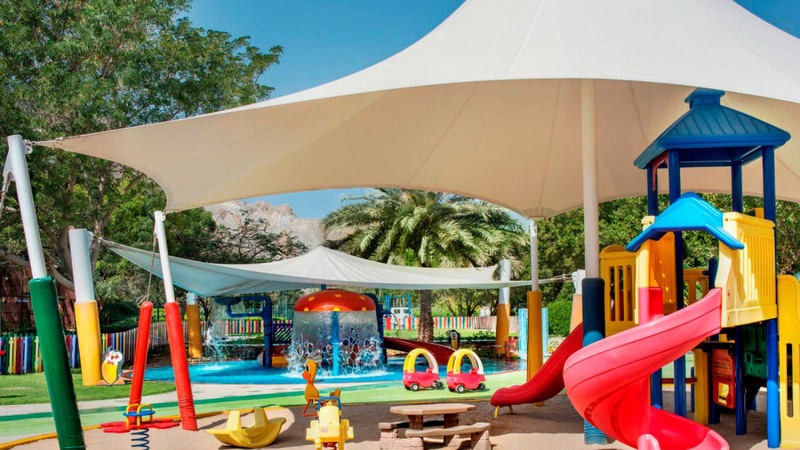 A few meters away you will find a large area for younger children, with small water pools, slides, sand and lots of colourful climbing frames. Behind the pool is the hotel’s 230m of private beach complete with shady palm trees, rattan loungers and rustic reed umbrellas. The beach is part of the Blue Flag program which recognises beaches for their sustainable initiatives, cleanliness and management of safety and services and is a haven of privacy and relaxation despite being mere steps away from the action of the main pool and beach bars.. From the comfort of your beach lounger you have an uninterrupted view of the shimmering waters of the Indian Ocean which is a perfect temperature for a quick dip if you need to cool off in the heat and the water is shallow for quite a way out so really safe for children to swim in. If you’d like to get out on, or into, the water you will find an on-site branch of the Al Boom diving school who are ready to help you. Al Boom organise snorkel trips, dive trips catering to all levels including complete beginners, motorised water sports, kayaking and many other water based activities so there’s plenty to do if you are looking to keep active. Kids will love crashing across the waves behind a speed boat on the doughnut or banana. If you want to stay active on dry land the hotel has a beach volleyball court, tennis courts, a football field, table tennis tables, a well-equipped gym and even a miniature golf course! Scheduled activities are also available such as aqua Zumba, circuit training and water polo. There is also a Kids Club and Teens Club, with plenty of activities to keep the little ones and not so little ones entertained. The activities vary daily and the hotel distributes a newsletter each day which tells you what’s going to be on. There are also babysitting services on site, which may come in handy if you have young children and want to have someone look after them after you have put them to bed, so you can enjoy diner at one of the many restaurants. 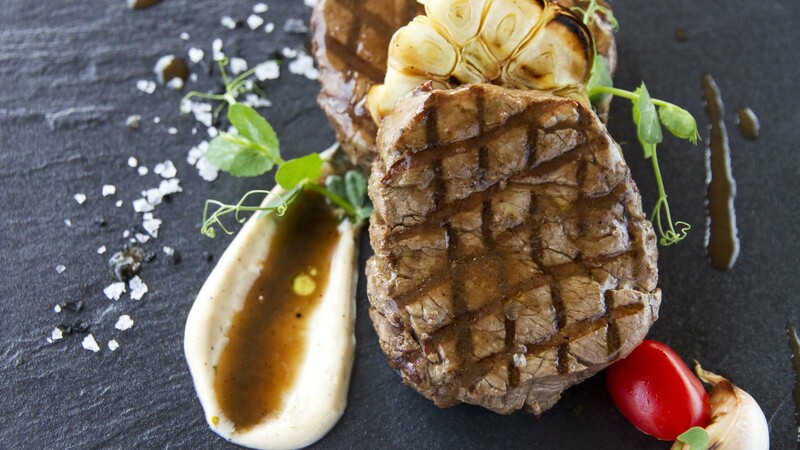 Of course, for us the most important thing about any holiday is the food and in this regard Le Meridien Al Aqah Beach Resort does not disappoint! 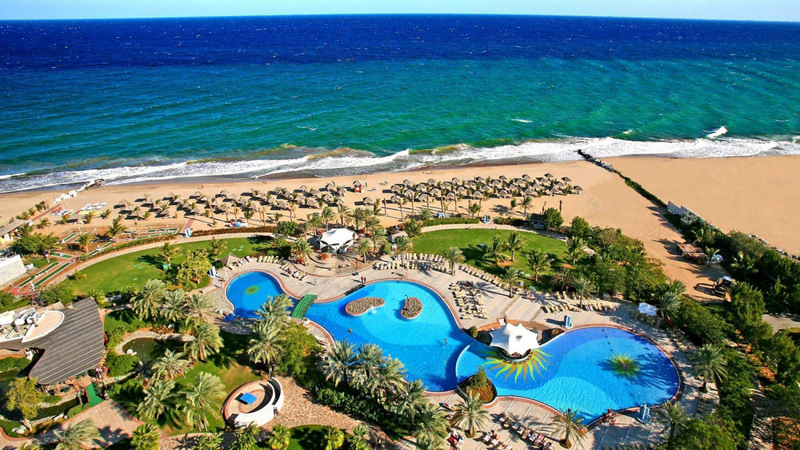 The hotel has a total of 4 signature restaurants, plus a buffet restaurant, two poolside restaurants and a tea lobby so there is lots of choice to keep the whole family happy! 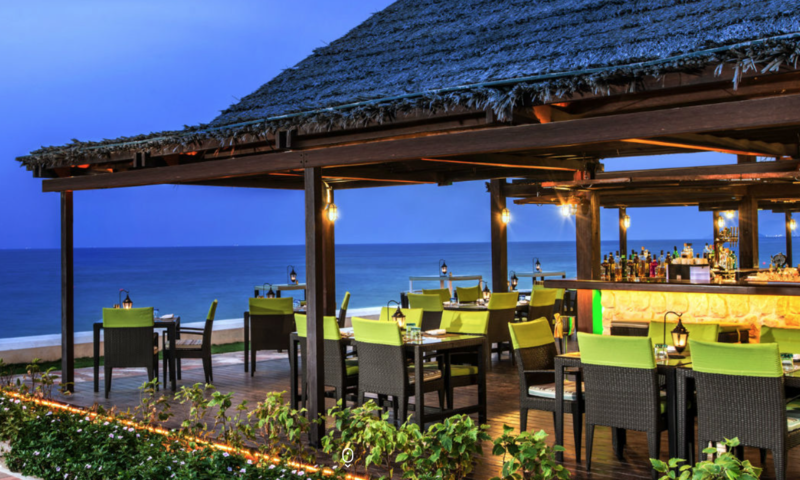 Gonu is the hotel’s steak and seafood grill and can be found sitting on the shores of their private beach. The restaurant is open air with plenty of shade and has a relaxed beach-bar vibe with cool dark wicker loungers and bold lime green cushions. Here you can sit just meters from the lapping waves and enjoy beautiful fresh fish, giant prawns and succulent steaks grilled to perfection. Gonu’s take on the “surf and turf”, in particular, is a spectacle to behold with a huge showy Omani lobster being served alongside prime Angus fillet steak but other dishes of note included a delicious fillet of Mahi Mahi, a chilled scotch bonnet gazpacho with juicy prawns and grilled tuna tataki with shrimps, calamari and whitebait. It’s a great chill out spot and the food is superb which led to us coming back here again and again during our stay for both lunches and dinners. If you venture away from the beach and cross a small bridge over some shallow babbling pools you will find Sapore, their Italian restaurant. 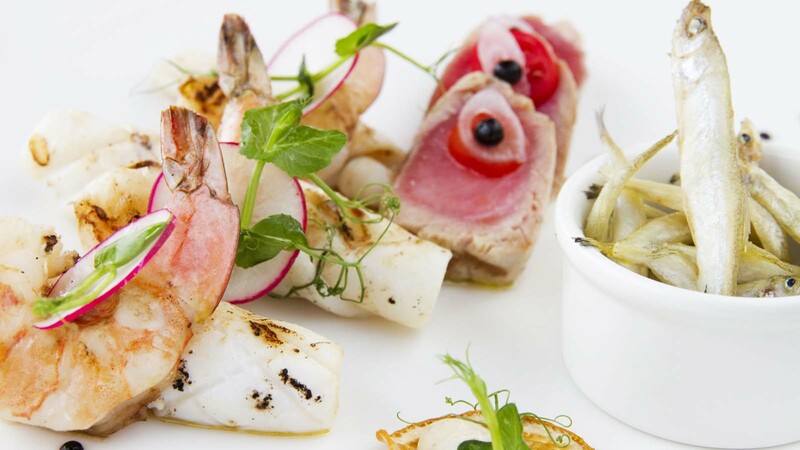 With terracotta tiled floors, masquerade themed décor and floor to ceiling windows opening out onto a large terrace overlooking the pool area, this Mediterranean restaurant offers diners a taste of Italy with its range of pizzas, pastas and antipasti. The buffalo mozzarella with five varieties of tomatoes was a simple but beautiful starter and the saltimbocca really melted in the mouth. There is plenty on this menu that will appeal to both children and adults. Taste is their stunning traditional Thai restaurant. Sourcing the finest ingredients from Thailand, Taste offers a mouth-watering range of Thai dishes including red, green and massaman curries, wok stir fries and noodle dishes. All of the dishes that we tried here were excellent and included a wonderfully tender duck curry, a delicious prawn, chilli and garlic stir fry and succulent chicken and beef satay skewers. The atmosphere is really intimate, making it the perfect place for a romantic ‘gown-ups’ meal. Rounding off the list of signature restaurents is Le Meridien’s upscale Indian restaurant, called Swaad. Swaad is an elegant contemporary space serving authentic Indian cuisine. The restaurant makes use of exotic herbs and spices and the menu is fresh and interesting and spans a range of dishes from curries to kebabs and is a breath of fresh air from the clichéd Indian options familiar to all back in the UK. The Goan prawns were especially tasty as were the tandoori chicken morsels (each prepared in one of 3 different marinades). In addition to the signature restaurants, the hotel also has a large buffet restaurant called Views. Located in a large atrium on the ground floor, Views has a constantly changing menu and wide range of foods on offer. Themed food nights include Mexicana, Asian breeze and taste of Arabia so guests will never be short on options. The restaurant has multiple live cooking stations keeping the hot food going as well as numerous salad bar and dessert options. Breakfast is also served here where you can enjoy a lovely crepe or omelette cooked to order alongside cereals, fruits, cheeses and charcuterie. This restaurant is perfect for keeping everyone happy as there are so many things to choose from. Of course, I couldn’t possibly complete a round-up of the food and drink options without mentioning the delightful Tea & Dates lounge and its incredible éclairs! With a wide variety of flavours on offer including the traditional vanilla, chocolate and coffee to the more interesting raspberry, pistachio and almond this became a firm favourite of ours and our daily éclair ritual became one of the highlights of our afternoon! Tea & Dates also serves excellent Illy coffee prepared by their highly trained baristas who even offer “Coffee-Graphy” classes where guests can design their own coffee art! We even had the pleasure one afternoon of helping to judge a staff coffee making competition and I can tell you that the standard was very high indeed! 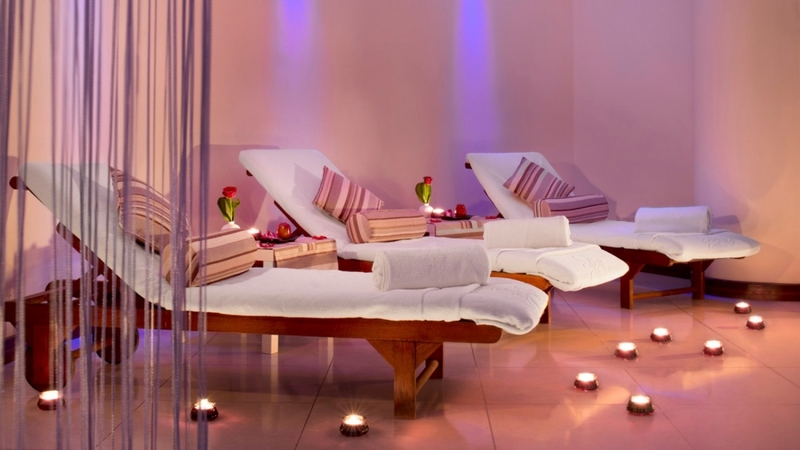 If you’re feeling a little exhausted from all the eating and activities and need a peaceful hour or two to yourself, then the Al Aqah spa is the perfect remedy. 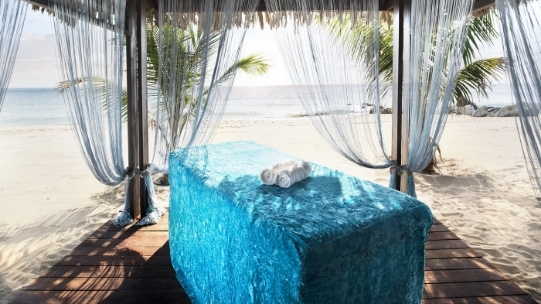 Within the softly candlelit walls of the spa you can enjoy massage, facial and body treatments with signature treatments from world-class beauty brand Clarins and the highly-acclaimed “Softouch Ayurveda”, the ancient Indian “Science of Life” designed to heal your body, mind and soul. 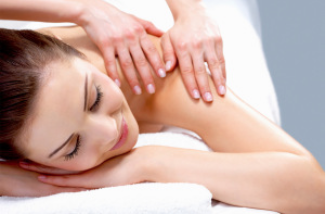 I opted for a facial and as the therapist gently applied the soothing treatments to my face I could feel what few troubles I still had melt away as I drifted off to sleep. All too soon our time at the hotel came to an end and we were very sad to leave. With one final éclair for the road, we got into our taxi and headed back across the mountains feeling relaxed, destressed and very well fed. Until this trip we had never heard of Fujairah but we fell in love and we are already planning a trip back for next Spring. You can fly direct to Dubai from the UK with Virgin Atlantic, flights starts from £360.